The Travelling Rubeshes: When it rains, it POURS! 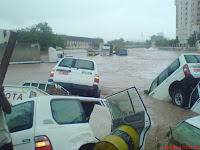 So you may have figured out by now that it doesn't rain a whole lot in Oman. If we get rain 2-3 times in twelve months, where're probably having really wet year! What you may not know though is that when it does rain... it really comes down - both falling from the sky and rushing down the mountains which form a natural wall on the south side of Muscat. 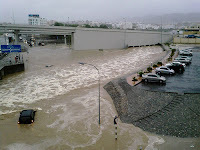 A gentle sprinkle last night quickly turned into a deluge of almost biblical proportions... causing flash floods down the wadis (dry river beds) that crisscross Muscat. A nice, paved road one minute, became a raging river the next. My drive to work missed the worst of this storm, but I did get to drive my tiny Daihatsu Sirion through about a foot of standing water! Yes, the entire ABA Varsity Boys and Girls basketball teams (travelling by bus) were stranded here in Abu Dhabi on Sunday night! We're praying that the TAISM teams landed safely on Saturday night! Hopefully, the ABA teams left this morning. Amy's team won the ISAC championship and Adam's team was runner-up. We actually have a video of Amy's final HS game. I'm starting to miss her already!! Stay in touch. I love the news of your family!